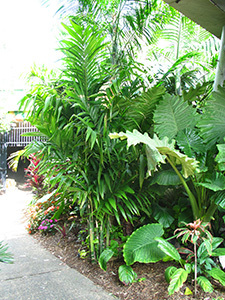 The Clumping Betel Nut is a beautiful, clean, feature palm growing to 3-4 metres after 15 years. It is very happy in the subtropics providing it is not subject to frosts or cold/dry winds. It can handle shade or mostly sun. 300mm $75.00 Special price: $0.00. No online sale. 45L $195.00 Special price: $0.00. No online sale.